These villas in Ovacik for sale are located in the lower valley of Ovacik in a prime location close to all amenities and is the perfect size for accommodating the whole family and friends with 5 large double bedrooms, private swimming pool and gardens. This is the perfect property in ovacik for either a rental investment because of location or for a residential home. INTERIOR: Open plan living area with large lounge, kitchen and dining area. Downstairs you will also find a separate W/C. Upstairs there are five bedrooms three of which overlook the swimming pool and garden area. There is a private parking driveway for the villa. EXTERIOR: Modern attractive design. Private swimming pool with landscaped garden area. Very private but close to all amenities and the Orka Club hotel with full use of all the facilities. 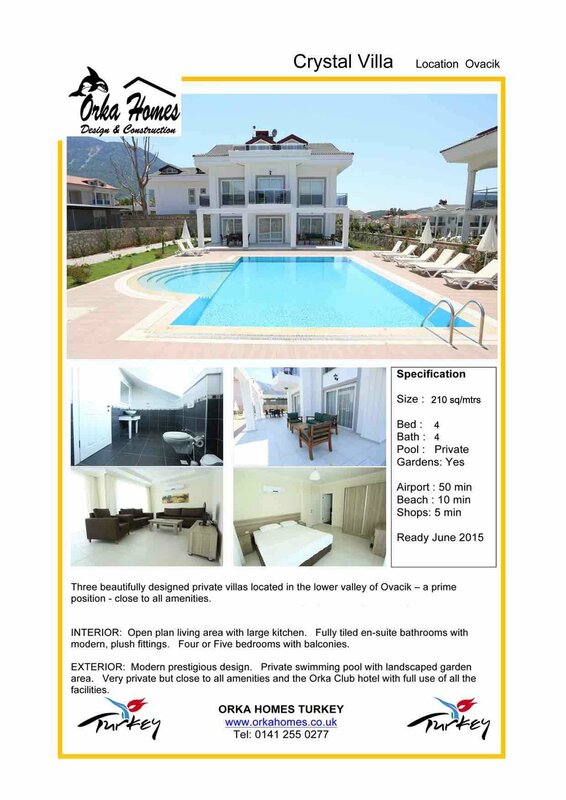 This villa in Ovacik for sale is wishing a 5 minute walk to all the local, restaurants, bars and shops and the main city of Fethiye is only a 10 minute bus ride away with the local Dolmus bus passing the main road every 5 minutes. The beach of Oludeniz is 5 minutes in the opposite direction making the villa perfect for the rental market or for your permanent residence. The villas in the lower valley are in a great location and only a few minutes walk to all the local facilities including shops, bars and restaurants. A short 10 min local bus ride will bring you to the beach of the Blue Lagoon of Oludeniz which is the best beach in Turkey. Fethiye town is close by with its large marina and shopping areas.